This entry was posted in The Way of True Blessing-Lessons in Obedience and tagged Bible, blessing, Dr. KP Yohannan, encouragement, gfa, Gospel for Asia, Hope, Jesus Christ, K.P. Yohannan, KP Yohannan, obedience on December 9, 2010 by gfaseo. Unless we are careful, we can be deceived by the Enemy’s whisper that tells us, “This obedience stuff is too hard. Abraham was only able to do what he did because God was showing such extraordinary favor to him. You’re just an ordinary, struggling human being with a lot of problems. You could never achieve that kind of life. Maybe Abraham could do it, but not you.” If we believe this lie, we are sure to remain spiritually stagnant, never walking any closer with the Lord. We need to remember that Abraham was no superstar—he had the same struggles and emotions as you and I. You see, whenever God invites us to make radical commitment, He always does it with the promise that His grace is sufficient for us to obey whatever He tells us to do. God always seeks to do the most impossible things through weak, struggling people. The only requirement is that we come to the place of total surrender and absolute trust in Him, just as Abraham did. The truth of the matter is that God has people in every generation who walk with Him and know Him intimately, just like the great saints of old—Abraham, Elijah, the apostle Paul and many others. All over the world today, there are humble, broken saints who quietly walk with God and experience the same blessing as Abraham experienced. And the living God calls each of them His friend. You and I are given the same privilege, the same opportunity and the same invitation that God gave to Abraham. But this will never become a reality in our life without our willingness to sacrifice. The life of Adoniram Judson is a classic example of an ordinary man who made a significant impact upon his generation because of his love for the Lord, his obedience and his sacrifice. Adoniram Judson was the first missionary to go to India and then on to Burma. He was born and raised in an average family, and as a young man he had the call from God to leave his familiar surroundings and go preach the Gospel in those faraway nations that had never heard of Jesus. It was in 1810, as he was getting ready for his departure, that he met a young girl named Nancy Hasseltine. He fell in love with her and wanted to marry her, so he sought permission from her father. The Judson’s labored for almost seven years before winning their first convert. After nine years they had baptized only eighteen. . . . Their first baby was stillborn during their initial voyage from Calcutta to Burma. Their second baby Roger died before reaching his ninth month. Adoniram himself was brutally imprisoned for seventeen months during a crackdown against all foreigners, barely surviving the horribly inhuman treatment. One night, while his raw and bleeding feet were hanging in elevated stocks, swarms of mosquitoes settled on his bare soles, producing excruciating torture. Then, not long after his release from prison, Adoniram’s beloved wife Nancy died. Her constant life of sacrifice and service had finally taken its toll. Just a few weeks later little Maria, their third baby, was suddenly taken from this world. Judson was left utterly alone in a hostile Buddhist land, almost shattered with pain and grief. Before him lay the prospect of tiger infested jungles, bat infested houses, and a fever infested climate—for life. Behind him lay an almost unimaginable trail of hardship and loss. But he did not leave off from his work. He did not abandon his Bible translating or his preaching and teaching labors. How could he? Eternal souls were at stake. Who else could reach the Burmese as well as he? So he remained for over 20 more years, returning to America only once—and that for necessity, not by choice. Can you imagine what would have happened if Adoniram had not obeyed the Lord and followed Him? What a loss that nation would have suffered! What millions of souls would have never found their way to heaven! But because of his sacrifice and obedience, his life was blessed and he became a blessing to millions. My friends, this is the way of true blessing: walking in the fear of the Lord and following Him at all costs. By His grace, may we all walk His path of life, living our lives for His glory and offering our bodies “as living sacrifices, holy and pleasing to God” (Romans 12:1, NIV). 1 Michael Brown, How Saved Are We? (Shippensburg, PA: Destiny Image Publishers, 1990), p. 97. This entry was posted in The Way of True Blessing-Lessons in Obedience and tagged Bible, blessing, Dr. KP Yohannan, encouragement, gfa, Gospel for Asia, Jesus, kingdom of God, KP Yohannan, obedience on December 7, 2010 by gfaseo. This entry was posted in The Way of True Blessing-Lessons in Obedience and tagged blessing, Christianity, Dr. KP Yohannan, gfa, Gospel for Asia, Hope, Jesus, K.P. Yohannan, KP Yohannan, obedience on December 2, 2010 by gfaseo. This entry was posted in The Way of True Blessing-Lessons in Obedience and tagged blessing, Christianity, Dr. KP Yohannan, encouragement, gfa, Gospel for Asia, Hope, Jesus, Jesus Christ, K.P. Yohannan, KP Yohannan, obedience on November 30, 2010 by gfaseo. This entry was posted in The Way of True Blessing-Lessons in Obedience and tagged Dr. KP Yohannan, gfa, Gospel for Asia, KP Yohannan on November 25, 2010 by gfaseo. “What friend?” I would reply, knowing I had only brought him and his sister to the playground. One of the true marks of friendship is that it is costly. Friendship, by nature, involves sacrifice. There’s a well-known song with lyrics proclaiming, “Take the world, but give me Jesus . . .”2 For most, this song remains a matter of emotion and feeling. But for one young man I met on the mission field, this song had a deeper, more intimate reality. Ram grew up in a prestigious Hindu family as part of the high Brahmin caste. He lived with the many benefits of being a Brahmin and was denied nothing in his life. But he grew up never knowing anything about the Savior, Jesus. It wasn’t until he received a Gospel tract while studying in college that he learned of the Lord Jesus Christ. Convicted of his sin and moved by Jesus’ love for him, Ram soon made a definite commitment to follow Christ and become a child of God. As he learned about being a disciple of Jesus, one of the first steps he took was to be baptized, making public his declaration as a follower of Jesus. When his family heard of his baptism, they became outraged, for the act of baptism was a public announcement that he was walking away from his previous life. In the Eastern cultures, religion is tied into every aspect of life—family, job, relationships—everything. It is not like changing the political party you are associated with. For Ram to walk away from Hinduism meant he was turning his back on the belief of his parents, his whole family and his village. And being from a respectable, high-class family, this had huge repercussions and brought shame upon his family. Ram’s parents and relatives tried their best to persuade him to come back to Hinduism. But when their gentle persuasions, tears and pleading failed, his family gave him an ultimatum: deny Christ or leave home, never to be part of the family again. The reality of walking away from the parents and the sister he loved dearly, including all extended family and the inheritance entitled to him as the son, was a tremendous sacrifice that flashed before his eyes. But a choice must be made. Walking away from everything he had, Ram left his home with only the clothes on his back to an unknown future. He had chosen Christ. Ram’s story reminds us a lot of the life of Abraham, who, having heard the voice of God, left his home and all familiar circumstances in Ur of the Chaldeans to follow his God. Many people, when they hear the name “Abraham,” immediately think of “father of many nations” or how, in a miraculous manner, he and his wife, Sarah conceived Isaac in their old age. And of course, it is impossible to forget about his incredible act of obedience as he prepared to sacrifice the son of promise. What a man Abraham was! Our minds easily classify him as a saint, and rightly so. But what makes all of this even greater is the fact that Abraham was nothing special. He was an ordinary man just like you and I. Raised in an idolatrous home, Abraham grew up knowing nothing about the living God. In between the stories of the incredible things that happened in his life, you’ll see a man who was fearful and weak, lying to protect himself and his family. Abraham was no superstar. Yet the living God called Abraham to come and walk with Him, inviting him to enter into a covenant and to know Him. “Now the LORD had said to Abram: ‘Get out of your country, from your family and from your father’s house, to a land that I will show you. I will make you a great nation; I will bless you and make your name great; and you shall be a blessing’ ” (Genesis 12:1–2). And when all was said and done, Abraham was blessed and called a “friend of God” (James 2:23). If Abraham was just an ordinary man, how was it that he became a friend of God? It is friendship with the Almighty, intimacy with Him, that was the true blessing in Abraham’s life. Thousands of sermons are preached today on the blessings of Abraham and how we, too, can lay claim to the very things promised him. But much of these teachings refer exclusively to material blessings and how it is possible to achieve material prosperity in this world. Have we forgotten that he who was blessed (Abraham) gave up everything, walking away from the material blessings afforded him by his family? Ancient history tells us that the Chaldeans, of which Abraham was a descendant, were by no means frugal sheepherders. They were a luxurious people, eating and drinking from golden spoons and cups and all the finest of ancient culture. Abraham was not looking for the blessing of things in this world and material possessions as the end and reward of his obedience. But he looked for and saw something most preachers and shallow Christians are not able to see today. If you were to ask Abraham what he would consider the greatest blessing in his life, he would surely echo Brother Ram: “to know the living God and be known by Him and to have Him as my friend.” This is the blessing of Abraham and the most incredible honor in life: to be called the friend of the Almighty God. We too are given the same invitation to friendship as was given to Abraham. And if we are truly seeking to have intimacy with the living God and not being satisfied with the things of this world, we, like Abraham, will know the friendship of God. God longs for that intimacy, that fellowship with us. He wants to share with us His intimate feelings and concerns. Our relationship with Him cannot be based just on the fact that now we are saved. We cannot just have the attitude that says, “Praise the Lord. Now I am saved. Now I am born again.” No. There is more! We must grow to the place where the Lord can say to us, “Tom, Lucy, John (whatever your name is), I just want to talk to you.” Then we answer, “Lord, what do You want to tell me? What do You want to say to me? What do You want me to do?” That kind of close relationship is what He wants—a friendship. He wants that friendship with us because He loves us and wants to share Himself with us. A friend of God. What an incredible honor! Do you truly long to have this kind of intimate and close friendship with God? If the Lord were to make a statement about you, would He be able to say, “He or she is My friend”? Think about it. The invitation the living God gave to Abraham is extended to you as well. Friendship is offered. But this friendship and intimacy do not come instantly or without a price. If Abraham was a man just like us and he became a friend of God—and God is no respecter of persons (see Acts 10:34)—then it must be possible for us to become the friends of God as well. How does this happen? 1 Gary Inrig, Quality Friendship (Chicago: Moody Publishers, 1981). 2 Frances Jane (Fanny) Crosby, “Take the World, but Give Me Jesus,” 1879. 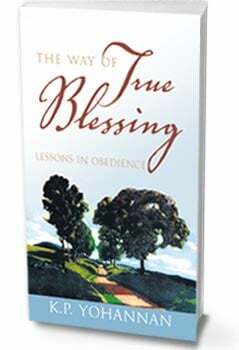 This entry was posted in The Way of True Blessing-Lessons in Obedience and tagged blessing, Christianity, Dr. KP Yohannan, encouragement, gfa, Gospel for Asia, Hope, Jesus, K.P. Yohannan, KP Yohannan, obedience on November 23, 2010 by gfaseo. There are plenty of books that tell about “how” to receive God’s blessings and how to obtain material blessings for a more comfortable life on earth. Yet we see through the life of Abraham that true blessing is much deeper than the material and comes only through a holy fear and love for God. So often our Christianity starts with us and ends with us. It is all centered around ourselves. Even when obeying some Scriptures (like “giving”) we are focused more on what we can get from it! May the Lord bring us to the place at which we obey Him because we love Him and do all for His sake because He is Lord. May our comfort, joy and peace not be the issue, but what our Lord wants. And only out of a life lived in the fear of the Lord and in love with Him will we find that our lives are blessed and we are a blessing. This entry was posted in The Way of True Blessing-Lessons in Obedience and tagged belief, believe, Christianity, Dr. KP Yohannan, gfa, Gospel for Asia, Jesus Christ, K.P. Yohannan, KP Yohannan, obedience on November 18, 2010 by gfaseo.